Recently while developing a sample application in ASP.NET MVC, I came across a peculiar situation. There was a LINQ to SQL class with several extensibility methods defined (OnXXXXChanging kind of methods where XXXX is the name of a property). The methods were performing some validation checks and in case of any violation were throwing exceptions. The LINQ to SQL class was working fine. However, at some places I wanted to display the validation errors (thrown by the class as exceptions) on the ASP.NET MVC views. That is where the problem began. No matter what exception you throw in the class the Validation Summary never displays the error message. 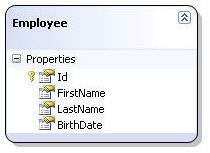 This behavior is by design and is intended to hide sensitive exception details from the end user. In this specific, however, I wanted to reveal the exception message to the end user because all exceptions were basically validation errors and I was sure that they are not disclosing any sensitive system information. To overcome the problem I developed a custom action filter. The remainder of this article explains how the custom action filter works. Now add a new LINQ to SQL class to the web application and create the Employee LINQ to SQL class by dragging and dropping the Employees table from the Server Explorer onto the design surface of .dbml file. The code creates a partial class Employee and adds extensibility methods OnFirstNameChanging() and OnLastNameChanging() to it (you can add additional methods for other properties if you so wish). If there are any validation errors the methods simply throw ValidationException. The Index() action method simply renders the Index view. 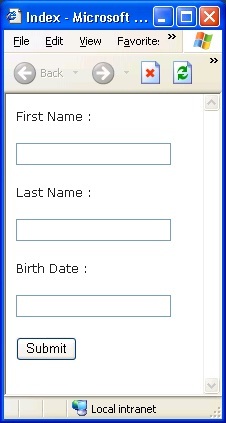 The Index view consists of three textboxes to enter FirstName, LastName and BirthDate and uses MVC Validations (see markup and screen capture below). 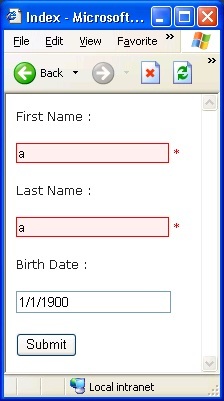 Notice that though FirstName and LastName fields are showing error (*) there is no descriptive error message at all. The actual error messages ("Invalid First Name" and "Invalid Last Name") are suppressed by MVC framework for security reasons. However, since you are deliberately throwing these exceptions you know that showing them to the end user won't create any problem. The ShowExceptionDetailsInValidationSummary action filter essentially loops through the Model Errors and then programmatically adds a model error message. 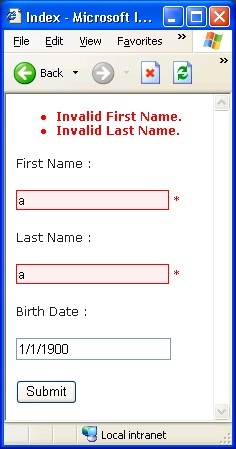 If you run the application again and try to enter invalid values for FirstName and LastName you will correctly get error messages as shown in the following figure. By default ShowExceptionDetailsInValidationSummary action filter will display all the exception messages in the validation summary. You can also specify that only certain exceptions be displayed. Further you can also customize the error message and keys using ErrorMessage and Keys properties of ShowExceptionDetailsInValidationSummary class respectively.